With mystery, magic and drama, you will be spellbound by this stunning barn conversion. Hidden in a beautiful corner of North Cornwall just three miles from the coast, this stylish Grade II Listed property sits within the grounds of the former landed Figg-Hoblyn estate. A walk through the nearby woodland will reveal the ruins of the manor house, left to rack and ruin after a family dispute; in fact the heir to the estate has never been found after disappearing to America during the Second World War. The sociable open plan living space spans the entire ground floor and provides the perfect place to catch up on the day's events or relax in front of a film. Upstairs antique French furniture in the master bedroom contrasts with the contemporary whites of the second bedroom which caters for adults or children with the option of a super king size or twin beds. High quality Vi-Spring mattresses and crisp white Egyptian cotton linens ensure a good night's sleep. The owners live in the adjoining barn and share the surrounding orchard and paddock. The terrace beside the ornamental pond is simply out of this world but please keep an eye on little ones as the water is deep. 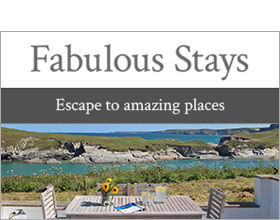 If you can drag yourselves away there are a dazzling array of sandy beaches to choose from within a short drive including Mawgan Porth, Fistral, Porth, and Holywell Bay. Watergate Bay has become the Mecca for water sports and the Extreme Academy on the beach certainly lives up to its name. The beach is also home a superb hotel with spa and Jamie Oliver's restaurant Fifteen which you will need to book in advance. There is a good foodie pub about a mile away plus further fantastic food options within easy driving distance at Padstow, Truro, Newquay and Mawgan Porth. For larger groups we also let the adjoining property The Hideaway (ref 1715) which sleeps 2. Two bedrooms: 1 x king size double, 1 x super-king double (zip and link to twin beds on request). Bathroom with Jacuzzi bath, shower cubicle, basin and WC. Kitchen with breakfast bar. Living room with dining area. Pub and shop 1 mile. Two pets welcome at £50 each per week. Short breaks taken at a minimum charge of £500.